This three bedroom apartment on the Cristimar complex, is one of our selection of Los Cristianos apartments. It can sleep up to 5 people. This was our second holiday in Los Cristianos. We prefer it to Las Americas as it is more of a family friendly resort. We prefer to stay away from the Veronicas Strip if at all possible. We travelled as a family of 5 people. 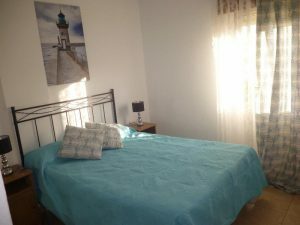 The apartment suited us perfectly as there was a double bed in the master bedroom for my husband and I, and the 2nd bedroom had 2 single beds which our twin boys had and our older daughter had the single room. We booked the apartment through Karen from Holidays4u.org. We thoroughly enjoyed our holiday and would definitely return to this apartment and this resort again. The apartment was spotlessly clean on our arrival and the towels were arranged in the shape of swans. Our children were very impressed by that. The complex itself is very close to the sea front, over the road from the Arona Gran. So everything we could need was close by, including restaurants, bars and supermarkets. We certainly didn’t need a car. That was what we wanted on this holiday: to be able to relax without having to drive anywhere. Not that I do any of the driving anyway. I find the roads in Tenerife, especially the motorway, to be a bit of a challenge, so I leave the driving up to my husband. It was a quiet complex, which suited us. There were only a few people around the pool when we were there. The balcony enjoyed a view over the pool. It was nice to sit out in the evening with a gin and tonic. This entry was posted in Tenerife Apartments and tagged #holidays4uorg, #karendurant, #loscristianosapartments, #tenerifeapartments by holidays4u. Bookmark the permalink.